In the beginning of 21th century global energy crisis wakened World War III. A lot of cities were destroyed and people abandoned them searching for better life. Now these abandoned cities are used as race tracks for a new kind of popular entertainment - Apocalypse Motor Racing. Daredevils from different corners of the world drive to victory through wrecked cars of their competitors in this deadly racing. 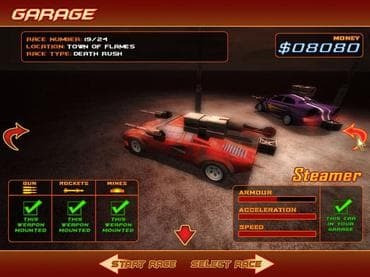 Download free full version game today and try to win Apocalypse Motor Racing or try to survive! If you have questions about Deadly Race game, please contact us using this form.